It Turns Out That Fighting Polio Is Good Training To Fight Ebola : Goats and Soda Nigeria knows how to beat back polio. And that's helped in the battle against Ebola. But other West African countries are struggling to beat the deadly virus — and neglecting anti-polio efforts. Nigeria has been a stubborn hot spot of polio — and that turned out to be a good thing when it came time to fight Ebola. In late July, a patient with the deadly Ebola virus arrived from Liberia. Health workers knew what to do. The country has created a massive public health effort to wipe out polio; institutions and strategies were repurposed to fight Ebola. On the other hand, anti-polio efforts in the countries hit hardest by Ebola are on hold — and that could lead to disaster. First, the good news, from Nigeria. One of the country's polio institutions is an emergency operations center run by the Global Polio Eradication Initiative. At the request of the government, senior officials from the center were sent to Lagos to help set up an emergency operations center for Ebola. Because of the anti-polio efforts, health workers in Nigeria were ready for Ebola. They had already been trained in contact tracing. And hospitals had procedures in place for reporting polio cases, says Jay Wenger, head of polio efforts at the Bill and Melinda Gates Foundation, which provides financial support to NPR as well as the Global Polio Eradication Initiative. "How you organize a team, how you collect the information, how you collate the information and make it available, is all part of the deal with polio," says Wenger. "They just transferred some of those techniques to the Ebola response." Nigeria was declared Ebola-free the second week of October. There's a lesson to be learned, says Wenger: it's a good idea to have resources and trained personnel capable of dealing with more than just a single disease. "Both polio and Ebola are examples of diseases we can handle if we have the adequate kind of health systems around," he says. "We need to do what we can to strengthen the health systems in many underdeveloped countries." But it takes time to create such systems. That means bad news on the polio front in the three countries with the highest Ebola counts. In September, 18 African countries including Nigeria synchronized a polio vaccination campaign, and reached 94 million children. Successful immunization requires several boosters, so a second campaign is starting up now. But Guinea, Liberia and Sierra Leone didn't take part in the first round and aren't taking part in the second round either. "This is a huge risk to polio eradication," says World Health Organization spokeswoman Sona Bari. "They're unprotected from any potential importation of polio." And they're missing other childhood vaccinations as well. The Global Polio Eradication Initiative is not planning any more immunization campaigns through the end of the year. "One can't argue with that," says Bari. "Countries need to be able to muster whatever health services they have in order to respond to the Ebola outbreak." But there's that "one plane flight away" problem that is critical for both Ebola and polio. If someone carrying the polio virus wanders into one of those West African countries, an epidemic could spark. And cases of polio could very well go unnoticed. Some of the most educated health care workers in the Ebola-affected countries have died; those who remain are busy with Ebola. There's already a sign that fewer health officials are looking for polio. The explanation is a little convoluted, so hang on. Sudden paralysis in children is a hallmark of the polio virus but also other can be caused by infectious organisms, congenital problems, exposure to toxic chemicals and more. Health officials at the World Health Organization look for a sudden paralysis rate in children under 15 in Guinea, Sierra Leone and Guinea of 2 in 100,000. But reports are down in those countries, says Bari, suggesting that there's not much polio surveillance. Missing a single case could send polio numbers ballooning. "If we take our eye off the ball we're up to 200,000 cases a year in the next ten years," says Carol Pandak, global director of Rotary International's Polio Plus Program. Rotary, a coalition of volunteer groups around the world focused on public service projects, has been fighting polio for 35 years. Pandak says they're not backing down now. The organization is continuing to support vaccination campaigns. "We've done nothing differently," she says. And they're working to expand their polio work. Rotary International is just beginning to get proposals from the three Ebola-affected countries for information campaigns for health workers, to piggyback on Ebola training. Pandak remains optimistic. 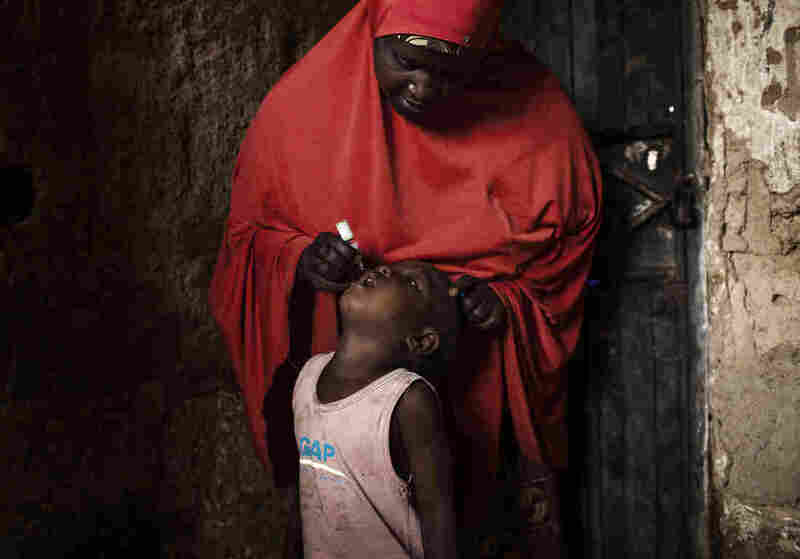 Nigeria, which has been the source of polio cases throughout Africa, has been polio-free since July. 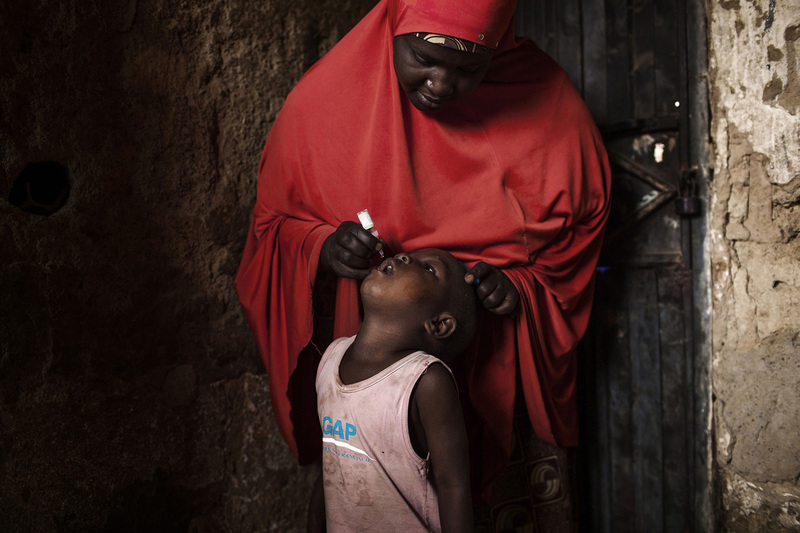 "Africa has never been closer to stopping polio than today," she says. Rotarians in Maine have been planning a trip to Nigeria in a few weeks to work on the polio vaccination campaign, and they have no plans to cancel because of Ebola.